Waking up at 11:11 a.m.
Irish Oatmeal with Strawberries, Maple Syrup, Cinnamon, and Kefir. Yerb Mate Tea. Teaching a couple lessons at Music Makers. Stopping by the thrift store around the corner – got two new blue dinner plates for Ana and I, and some medium sized glass jars. Teaching more lessons at Music Makers. At the Great Neck Rec making use of the fitness room then playing a few games of adult basketball. Back home. 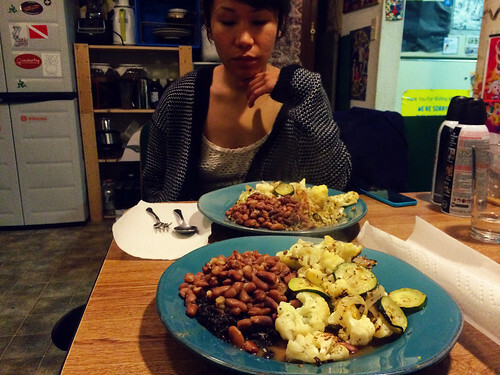 Enjoying a substantial dinner with Ana: Beans, Cauliflower, Zucchini, Onions, and Black Rice. Research. Learning "Linus and Lucy".